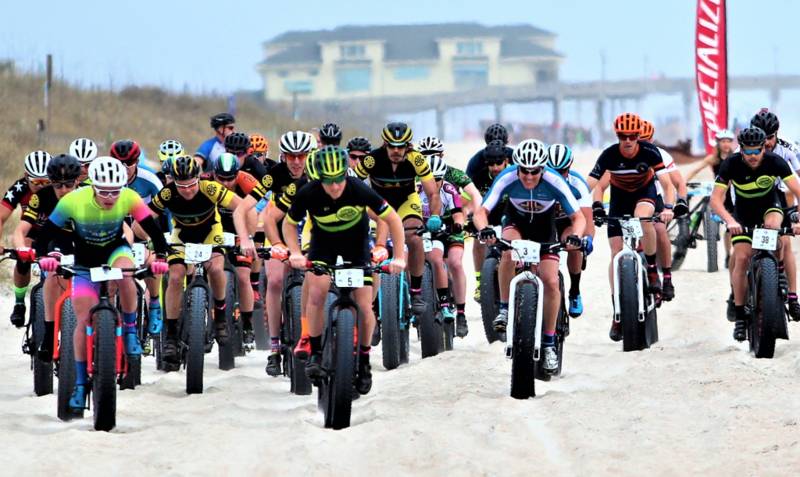 WRIGHTSVILLE BEACH, NC – Already the largest fat bike beach race on the East coast and named one of the Top-20 festivals and events in 2018 by the Southeast Tourism Society, the US Open Fat Bike Beach Championship may double in size in 2019. “With two months to go, we already have 73 bikers signed up for the races,” said Spencer. “These athletes represent 39 communities in seven states, including North Carolina, South Carolina, Virginia, Maryland, Pennsylvania, Ohio, and New York.” Spencer expects a full slate of 200 bikers in 2019 and is awaiting registrations from Georgia, Florida, Michigan, and California. “The return of the last three champions is creating excitement surrounding the 2019 women’s elite race,” said Spencer. Mount Airy’s Philicia Marion (Cycleworks Xpedo Professional Mountain Bike Team presented by Vittoria), will defend her 2018 championship against 2017 winner Zdenka ‘Zoe’ Worsham (Crank Arm Brewing Professional Team of Raleigh), and 2016 champ and “fat bike aficionado” Jesse Piersol of Downington, PA. The competition will be equally fierce in the men’s division with a deep lineup of elite bikers seeking the top spot. A top contender to watch is 2016 champion Robert “Fear the Beard” Marion of Mount Airy (Cycleworks Xpedo Professional Mountain Bike Team), recovering from a 2017 bike injury. “It’s amazing and very exciting to see so many people coming together to support the races and our community following Hurricane Florence. We are very grateful,” said Spencer. The US Open Fat Bike Beach Championship will benefit the Wrightsville Beach Foundation, a nonprofit organization dedicated to improving public parks and amenities for residents and the island’s many visitors each year.